You can specify your identity and choose preferred pronouns. Grindr is rolling out new features to be more inclusive of transgender members. User profiles now include a new "identity" feature that includes options for listing gender and preferred pronouns. Members can pick from a list of common gender identities such as "trans man", "woman", "cis man", "non-binary, "non-conforming" and "queer", or specify their own identity if it doesn't appear on the list. Pronouns such as "he/him/his", "she/her/hers" and "they/them/theirs" can also be chosen, or specific pronouns written if not listed. Writing throughout the website has also been updated to include gender neutral terms. The changes coincide with Transgender Awareness Week, and are the result of a survey of 5,500 existing trans users, as well as a consultation with the National Center for Transgender Equality. "One thing we heard over and over again from trans people using Grindr was that they felt unwelcome and that their non-trans peers only wanted to ask them about what it means to be trans or approached without knowing how to speak respectfully about trans issues," said Jack Harrison-Quintana, Director of Grindr for Equality. "That's why we created written resources linked from the gender identity fields in the profile to answer cis users' questions and decrease that burden on trans people." The update also includes a comprehensive FAQ on transgender issues to help non-trans members interact courteously. Considering Tinder -- a dating site generally considered more binary-focused -- implemented transgender options last year, many will question why Grindr, a dedicated queer space, has taken so long to introduce these features. However, the company has been addressing trans issues for some time, having included a trans option in its "Tribes" feature back in October 2013. Plus, as Grindr notes, the company wanted to make sure it got the update right for its trans members. "As the largest global queer social network, Grindr has always had trans men, trans women, and non-binary users on the app," said Peter Sloterdyk, VP of Marketing. 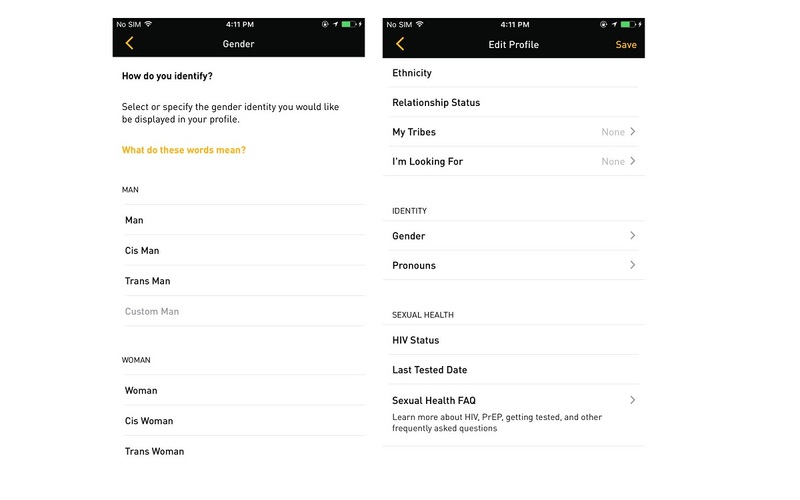 "We are proud to release these updates to our core functionality to firmly establish that we are committed to making Grindr a welcome and safe space for trans people."